The global electronics adhesives market is characterized by the growing presence of leading players in the emerging economies of Asia Pacific. This region presents a mammoth opportunity for all those involved in the production, sales, and distribution of electronics adhesives. As a result, an increasing number of market players have been considering the expansion into Asia Pacific as a major strategic move for a wider reach and to strengthen their position in the global market. Apart from this, the market for electronics adhesives is anticipated to benefit from the rising demand for more compact and lighter components from the electronics industry. Add to this, the growing penetration of the Internet of Things (IoT). The surging adoption of connected devices has transformed the way electronic appliances are built, giving players a significant opportunity to make the most of this trend. As per the projection of this business intelligence study, the demand in the global electronics adhesives market will expand at an impressive 12.03% CAGR from 2017 to 2020, with the overall valuation estimated to reach US$6,397.7 million by 2020. This report on the global market for electronics adhesives comprises five regional segments: Asia Pacific, North America, Latin America, Europe, and the Middle East and Africa. The volume of the APAC electronics adhesives market is poised to rise by more than 10.1% each year from 2017 to 2020, and attain a demand valuation of US$4,055.5 million at the end of the forecast period. The analyst of the report has estimated that Asia Pacific will produce a demand for 1,230.9 tons of adhesive materials such as epoxy, silicone, polyurethane, and acrylic by the end of 2020. The value share of the APAC electronics adhesives market was pegged at 61.4% in 2017, amounting to US$921.7 million. The active use of electronics adhesives in Asia Pacific can be attributed to the strengthening presence of electronics device manufacturers mainly in China, India, and South Korea. The abundance of raw material, low labor costs, and technological expertise are some of the key benefits that the region offers, making it the most lucrative market for electronics adhesives. Apart from Asia Pacific, North America also presents a multi-million dollar opportunity over the course of the forecast period. Electronics adhesives find application is encapsulation, conformal coating, wire tracking, and surface mounting. Surface mounting adhesives form the largest application segment and are likely to continue their dominance throughout the forecast period of this business report. The opportunities in this segment are evaluated to amount to US$1,983.3 million by 2020, exhibiting a strong CAGR of 14.3% during 2017 to 2020. The surface mounting segment is projected to hold a 31% share in the electronics adhesives market by the end of the forecast period thanks to the surging demand for PCB-based electronics devices across various sectors such as automotive, consumer durables, and industrial. The report also segments the global electronics adhesives market on the basis of material, into polyurethanes, silicones, arcylics, epoxies, and others. Acrylic is the most widely used material for electronics adhesives and their impressive performance characteristics are expected to drive this material-type segment at a robust 22.0% CAGR. 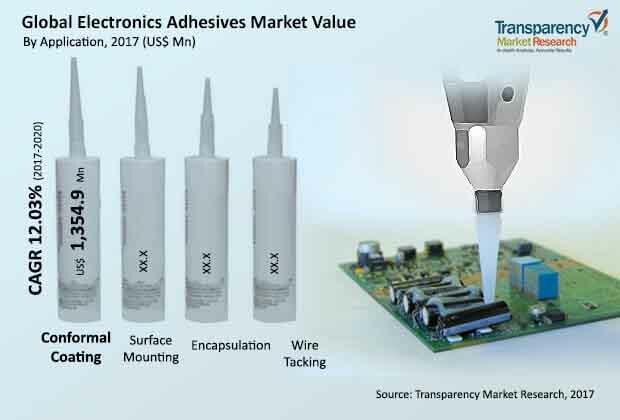 Accounting for a share of over 40% by 2020, electrically conductive adhesives are likely to emerge as the largest product type in the coming years. 3M Company, Dymax Corporation, Dow Corning, Evonik Industries AG, Henkel AG & Co. KGaA, and H.B. Fuller Company are some of the prominent companies operating in the global market for electronics adhesives. Adhesives are substances used to bind two or more surfaces or components together. Specialty adhesives possess specific features that render them useful for specific high-value applications across a multitude of industries. Electronics adhesives are one such specialty adhesives used for the assembly and packaging of electronics in industries such as automotive, consumer electronics, and medical devices. The rising demand for electronics devices across the globe has resulted in the increasing demand for adhesives with specific properties and characteristics suitable to the intended application. The report carefully examines the global electronics adhesives market from 2017 to 2020, the forecast period. The key economic, consumer, geographical, and socio-political trends observed in the market, the forces of supply and demand, the drivers and restraints, and the impact of these factors have all been evaluated in this publication. The report is designed to offer clients valuable and actionable insights on the global electronics adhesives market. The objective and accurate information provided in this study guide readers in making crucial decisions for the future of their businesses. The key opportunities that lie ahead have also been highlighted, serving as the perfect tool for shareholders. For the purpose of this study, the global electronics adhesives market has been reviewed based on product type, end use, material type, and geography. The electronics adhesives market has been segmented based on type of material into epoxy, polyurethane, silicone, acrylic, and others. By product type, the electronics adhesives market includes UV cured, thermally conductive, electrically conductive, and others. The major applications of electronics adhesives include encapsulation, conformal coating, wire tacking, and surface mounting. Conformal coating and surface mounting are the two leading application segments, together accounting for a share of 61.4% by the end of the forecast period. The global electronics adhesives market has been divided on the basis of region into North America, Europe, Latin America, the Middle East and Africa, and Asia Pacific. Asia Pacific is the most promising market for electronics adhesives and this region is poised to expand at a 10% CAGR during the forecast period. The surging production of consumer electronics in countries such as India, South Korea, Japan, and China has greatly contributed toward the growth of the APAC electronics adhesives market. The global market for electronics adhesives is primarily driven by the growing usage of electronics components across several applications such as automotive, consumer electronics, medical devices, imaging devices, and aircraft. The rising use of connected devices and the growing trend of miniaturization of electronic devices have also driven the demand for electronics adhesives. Other factors supporting the electronics adhesives market include the rise in disposable income, changing lifestyle, and the surging consumption of automated appliances. Enterprise electronics are likely to generate the highest revenue by the end of the forecast period while electronic appliances are expected to fuel the market in terms of volume. On the flip side, strict government regulations curbing VOC emissions and the volatility in feedstock prices threaten to hamper the growth of the electronics adhesives market. The key players studied in the report are Dymax Corporation, Henkel AG & Co KgaA, H.B. Fuller Company, 3M Company, Evonik Industries AG, and Dow Corning.